Readiness is the Army’s number one priority. It requires the strategic capability to procure and manufacture munitions when and where they are needed. Understanding how and why to do this requires a full understanding of the historical development of the American conventional munitions industrial base (CMIB), including a study of some of the devastating lessons learned along the way. A chronic problem with which Soldiers struggled throughout most of the American Revolution was the shortage of munitions. During that war, nearly all of the shots and shells fired but only a meager 10 percent of the gunpowder used were locally produced. During the early years of World War I, European nations modernized weapons with machine guns, tanks, airplanes and larger artillery, leaving the American CMIB unable to supply munitions to these new weapon systems. This forced the United States to rely on foreign firms for most of its munitions requirements. By the start of World War II, the United States lacked a peacetime munitions industry; this forced the military to develop the capabilities of commercial manufacturing plants and training of its production personnel on its own. By the end of the war, the United States had constructed nearly 60 munitions manufacturing plants. Sadly, the nation was unable to support the munitions needs during the initial few years of the Korean conflict. During the Vietnam War, the CMIB consisted primarily of machines left over from World War II and representing technology from World War I. Today, the top commercial munitions managers concentrate more on bottom-line financial returns for their shareholders, increasing their share of the market, eliminating competition and reducing the number of available firms. 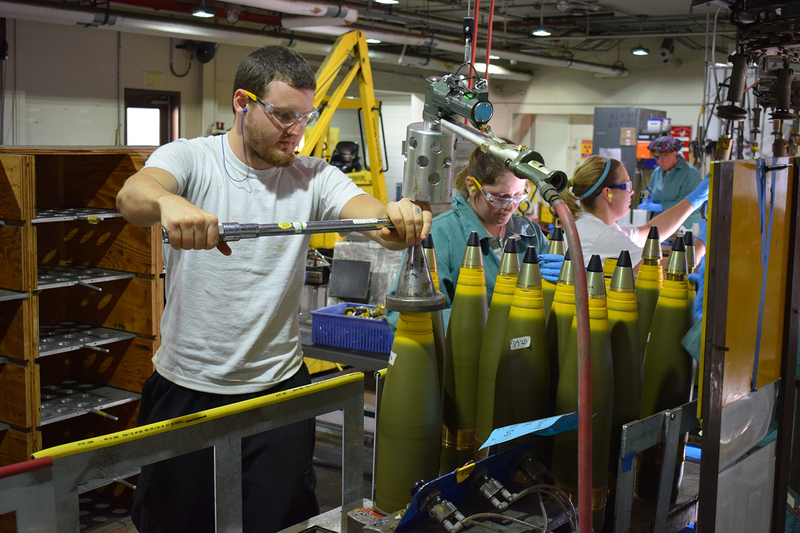 The American CMIB faces several challenges that could impact munitions readiness to Soldiers in the future. One of these challenges includes the quantities and age of the munitions in storage. Nearly a third of the almost 3,000 types of munitions are short of the required quantities and nearly one quarter of the stored munitions are more than 25 years old. The United States should conduct a comprehensive strategic review of its munitions and demilitarize those items it no longer needs. Another challenge is that much of the equipment in the CMIB government facilities is old, obsolete and expensive to operate, indicating capability concerns for sustaining the quality and quantity of munitions required for a prolonged national emergency. As such, the United States should decide which part of the CMIB should be saved and which part should be eliminated. The last challenge is its workforce; the skills involved in munitions-related production generally cannot be adapted to commercial application, nor can existing commercial production experience be converted to munitions productions. It is critical that munitions-manufacturing skills be preserved. The commanders of the government munitions plants should be given the authority to hire government workers to meet its workload and to mitigate anticipated losses through over-hiring. Although not perfect, the CMIB supported the U.S. military successes from initial sovereignty more than two centuries ago to its undisputed global superpower position today. While it was good enough for the past, by and large, the question now is whether it will be good enough for future needs. Although it is not as necessary during long periods of reduced demand, when demand does increase, CMIB needs to be responsive, dependable and reliable. There is a crucial question facing the nation, the same question that it has had to answer repeatedly for more than two centuries: what can be done to ensure that the CMIB is given sufficient resources to sustain Army readiness?